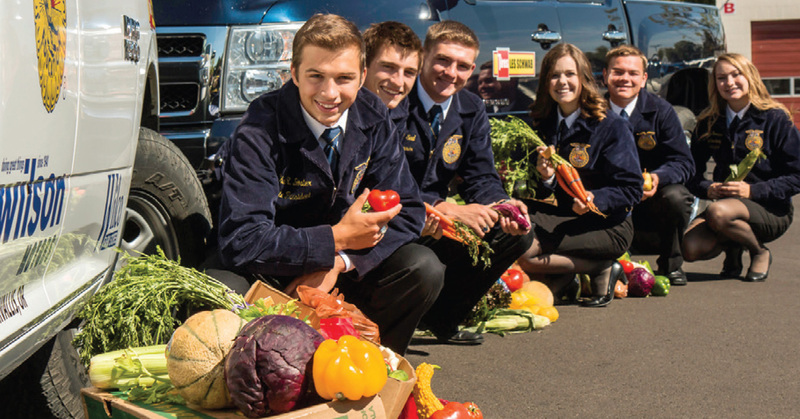 FFA Students collected more than 500,000 pounds of fresh food for the Oregon Food Bank — twice the amount brought in last year. 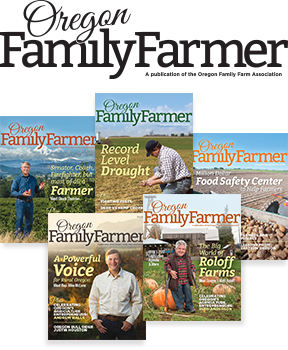 The Oregon Future Farmers of America stepped up to the challenge when Les Schwab Tire Centers approached them a few years ago to help collect food for the Oregon Food Bank. Their partnership to Drive Away Hunger has been a huge success. This past fall they collected more than 500,000 pounds of fresh food — double the amount brought in the previous year. In addition to the fall food drive, 500-700 FFA students hold a Day of Service at their annual convention in March and collect another 90,000 to 100,000 pounds of food which they package up for the food bank. Between the two groups, it’s a well-oiled machine. Les Schwab stores around the state are the drop off locations for donations from the public, and students from local FFA chapters pick up the donations and deliver them to regional food pantries. The food — all fresh vegetables and produce like potatoes, squash, onions, beets, and apples — stays in that community to meet the needs of families there. Over the past couple of years, Drive Away Hunger has collected more than a million pounds of food, enough to feed 2,500 Oregon families for a month, well over 380,000 meals. “The FFA thanks all the farmers, community members, and everyone who dropped off food or gave to this effort,” said Kevin White, Executive Director of the Oregon FFA Foundation. Future Farmers of America was founded back in 1928 by a group of young farmers from 18 different states. Their mission was to prepare future generations for the challenges of feeding a growing population and to offer opportunities for leadership development. Today all 50 states and two U.S. territories have chartered members of the National FFA Organization, with nearly 630,000 student members, 6,000 of which are from Oregon. These days the FFA goes well beyond simply exhibiting livestock at the state fair. Membership is not just for students who want to be farmers, but also includes those who are aspiring teachers, doctors, scientists, business owners and more. In addition to agricultural education, they participate in career development and leadership conferences; have opportunities to travel and to apply for $2 million in scholarships; and give back to their communities through projects like Drive Away Hunger. Since the Oregon FFA Association lost state funding in 2011, their programs and scholarships are funded by support from businesses and individuals and raised by the non-profit FFA Foundation. Their board is made up of members of the agricultural industry, educators, business leaders, donors, and always includes an active farmer. While most of the board’s fund-raising focus is on sponsorships and donations, at this year’s state convention in Redmond, they’ll also be hosting an event: country music singer and songwriter Jerrod Niemann will be performing a benefit concert on March 25th which is open to the public. To learn more about Drive Away Hunger and the FFA Organization or to get involved, visit the Oregon FFA Facebook page, www.oregonffa.com or www.ffa.org.